I have a long-standing love of cheesecake. It started in my childhood with cheesecake from a box and grew from there. It was usually my go-to dessert choice when we went out. Then, I realized how simple they are to make, and now I love them even even more. Philadelphia Cream Cheese is celebrating Easter this year with Bring Out the Silver, a virtual recipe swap among selected food bloggers who are bringing out the silver by baking cheesecakes using Philadelphia Cream Cheese in its unmistakable silver package. When they asked me to be part of that campaign, I knew that I couldn’t pass up that chance to celebrate with one of my favorite baking ingredients. Before we get to my cheesecakes, let’s talk a little about Philadelphia Cream Cheese and why I like it. Having been around since 1872, they definitely know what they’re doing. Their cream cheese is made in Wisconsin and New York using fresh milk from local dairy farmers. Their standard is that the milk is made into cream cheese within 6 days, ensuring a fresh product. I also like their use of other real ingredients and their limited use of preservatives. In fact, the brick cream cheese I use for cheesecakes has no preservatives. If you’re intimidated by making cheesecakes, please don’t be. They’re really not hard to make at all. Just a handful of ingredients can be mixed together quickly to make an amazing cheesecake. The most common problem is really just an aesthetic one – cracking. 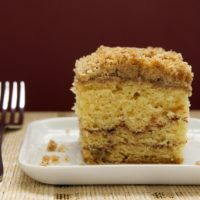 You can try to prevent it by not overmixing the batter, keeping the oven door closed for the entire baking cycle, and running a knife around the edges after baking to loosen it from the pan. I brought out the silver for these luscious little cheesecakes. 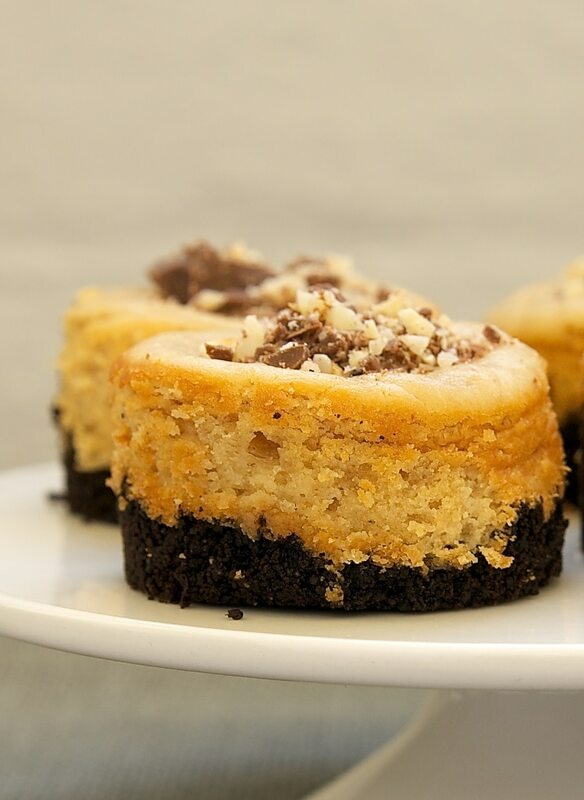 A dark chocolate cookie crust is topped off with a sweet, creamy peanut butter filling. For a little something extra, I garnished them with a mixture of chopped chocolate and roasted peanuts. I love peanut butter and chocolate pretty much on par with how much I love cheesecake. So, these little beauties are a big winner with me. For more recipes, be sure to visit creamcheese.com. 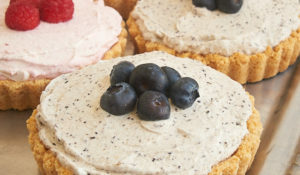 Please also visit the other bloggers who are participating in the Bring Out the Silver campaign to see their amazing mini cheesecake creations. I’m definitely in very good company! Scroll past the recipe for information on how you can enter to win a giveaway from Philadelphia Cream Cheese. Mix cookie crumbs and butter until well blended. 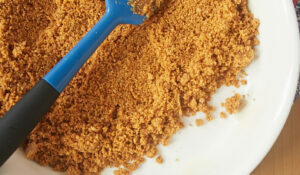 Press about a tablespoonful of mixture into the bottom of each cavity. Using an electric mixer on medium speed, beat cream cheese, sugar, and peanut butter until combined. Add egg and vanilla, and mix until blended. Top each crust with about 2 tablespoons of filling. Bake 18-22 minutes, or until set. Cool in pan for 1 hour. Remove from pan, cover, and refrigerate for at least 2 hours. 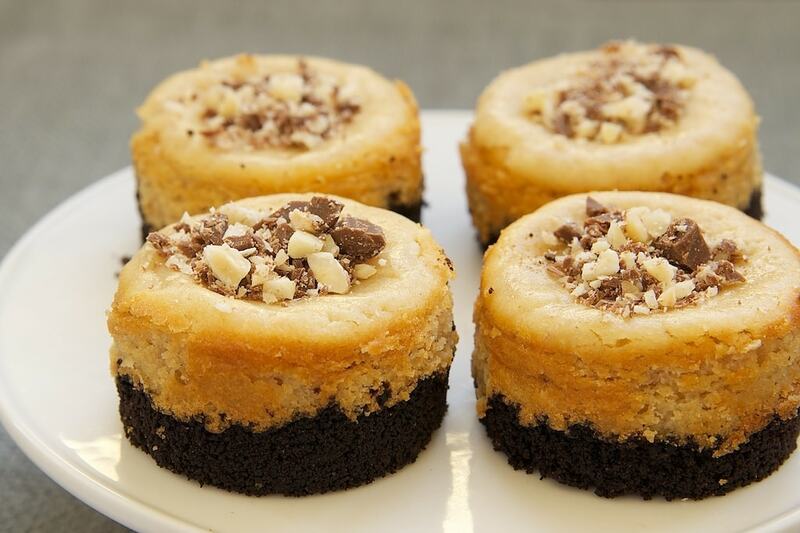 Before serving, sprinkle a mixture of chopped milk chocolate chips and peanuts on top of each cheesecake. *I used Nabisco Chocolate Wafers and ground them in a food processor. For 1 cup, you’ll need about 20 cookies. 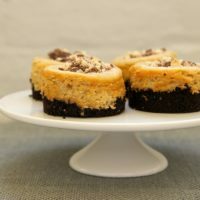 **A mini cheesecake pan works very well for these. 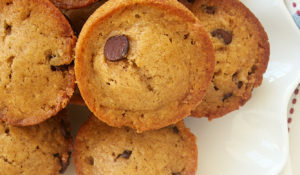 You can also use mini muffin pans, but I would suggest lining them with paper liners. 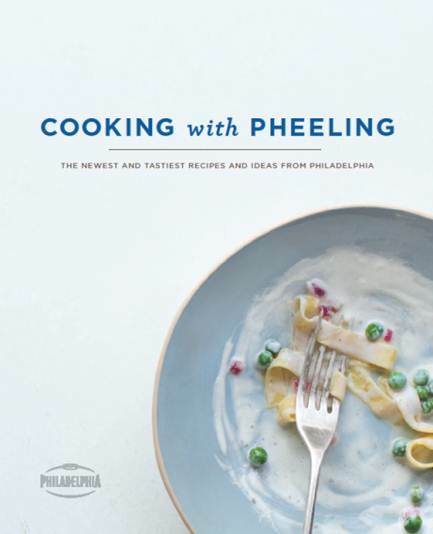 Kraft Foods and Philadelphia are offering two Bake or Break readers a copy of Cooking with Pheeling, a cookbook featuring over 50 recipes using cream cheese in appetizers, side dishes, entrées, and desserts. Please read the entry details below. Good luck! Disclosure: I have been selected by Kraft Foods to be an ambassador for Philadelphia Cream Cheese. I was compensated for my time and recipe development. The prizes are provided by Kraft Foods at no cost to me. This giveaway is not administered or sponsored by Kraft Foods or its affiliates, but by Bake or Break. My opinions, as always, are my own. I like to use it in my pierogi dough! It’s the best…. These mini cheesecakes look luscious! Everyone’s favorite flavors in one dessert. 🙂 The little size makes them so easy to serve. I love to include cheese cake on a buffet but no one wants to slice cake for themselves. This is perfect. Thanks. These little cheese cakes looks so tasty, and the perfect size, i wish i could eat peanuts! 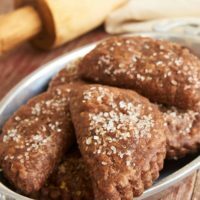 I might have to try and make them with cashew butter instead. I love making cheesecake and definitely cream cheese buttercream frosting with it!! I like cream cheese two ways, as a shmear on my bagel, and in a cheesecake. I make cheesecakes frequently for my family and for others. I wouldn’t use any other brand! Philly is the best! I usually use Philly on bagels, but I also cook with it. I’ve learned that a bit of cream cheese adds a lovely smoothness to sauces, and it’s great in baked goods like cookies or coffeecake. Love it on a toasted bagel… perfection! I most recently used Philadelphia cream cheese in a brocomole recipe. I love adding cream cheese to my mashed potatoes! Interesting to see how Philadelphia have picked up on this, and now run commercials featuring mini-recipes showing the versatility of their product. It used to be just marketed as a low-calorie biscuit accompaniment. Mini cheesecakes are my favorite kind of cheesecakes. The peanut butter and chocolate goes right up to the top of the list! Can’t wait to try these! I love to eat it with habanero pineapple jelly. Mostly on bagels! Otherwise, in a cheesecake or in my favorite trifle recipe. I love cream cheese on any kind of bagel and frosting! I use cream cheese in lots of ways because I love the tang. And as a kid my mom used to make me cream cheese and jelly sandwiches instead of peanut butter, best ever! So favorite is for tasty sandwiches and on bagels, but I use it for frosting and sauces and dips too. I add about 1-2 Tbsp of cream cheese to my bowl of hot (anytype) soup to make it creamy. Also I love it on toast with jam. I love using it to make a skinnier alfredo sauce! But I also love cream cheese in almost any recipe. Ive would make a yummy spinach cheesy artichoke dip!! 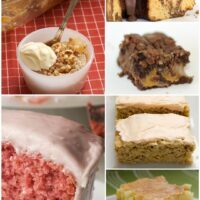 I love to use cream cheese in so many different things, but I think my favorite is cream cheese icing! Who doesn’t love cream cheese? These look so yum and since they are bite sized, they shouldnt completely wreck the diet. I love to simply spread it on my bagels ! Of course ! I like using it in my cooking and making desserts. Cheesecake? Yes, please. Minicheesecake? Yes, indeed. Nothing else. My favorite thing to make is a big cheesecake!! I love to use it in dips!! 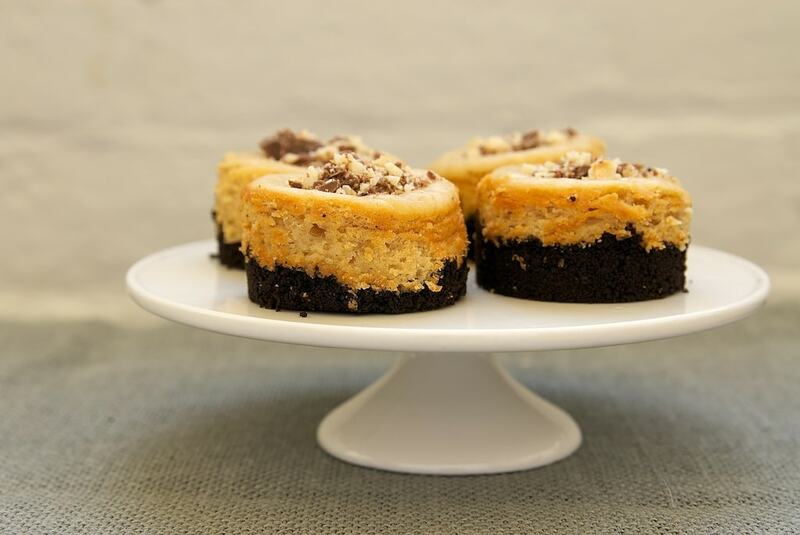 Your mini peanut butter cheesecakes may be my new favorite recipe from your blog! Love the mini-sized portion control! I use cream cheese most often in frostings. There are so many ways in which to use cream cheese and I would not mind learning some more. I am a cheesecake fiend, so that’s my main use, but I also love bagels and cream cheese. Cream cheese is the staff of life! I love using cream cheese mixed with a packet of taco seasoning and spread onto tortillas which are then rolled and sliced…tortilla roll-ups…a party favorite! Chocolate and peanut butter is my love language. Love this! I love to use cream cheese in a frosting for cupcakes. Cream cheese frosting is the best! I love, love love these cheesecakes. OMG I’d eat all of them! Oh my, there are so many ways to use cream cheese. I absolutely love cheesecake & also cream cheese frosting. Those are my favorites. Can’t wait to try this recipe! I use cream cheese in frosting. I love using it in dips and making cream cheese frosting! I love it on BAGELS! my favorite way to use it is when i make cheesecake. I do love cheesecake. Tend to over mix them, though, and they crack. But they still taste great. I’d totally make mini cheesecakes too. Yum! These look delicious! I’ve never had a peanut butter cheesecake. Sounds like I need to fix that! I like to use my cream cheese with pasta! I like to make a smoked salmon spread with cream cheese. I love it in my Frank’s Dip! I love using it in my quiche crust, makes it sooooo good! 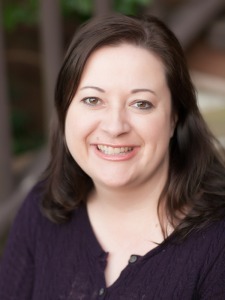 I use it in my husband’s favorite dessert…. 4-Layer Pudding Dessert. Yum!!! That or my “healthy” alfredo sauce with 1/3 less fat cream cheese. These are soo cute! 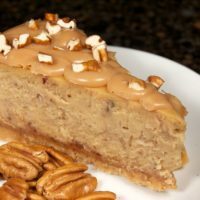 Ive never made peanut butter cheesecake, but I really want to! My favorite thing to do with cream cheese is to make gooey butter cake, and of course, cheesecake 🙂 I recently made an Irish Creamer cheesecake (recipe from Crazy for Crust) and it was a dream! I love to make Mini cheesecakes, chocolate is especially my favorite. I love using it in banana bread and it is great to put a few dollops in homemade tomato soup. I love Philly Cream Cheese on bagels! 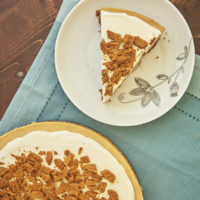 I just made a pie with Biscoff Spread and Philadelphia Cream Cheese and it was delicious! I also use if in my cheesecakes and appetizers. Thanks for the giveaway! oh, I also like Philly on sandwiches–especially turkey with cranberry sauce. These look ridiculously delicious. 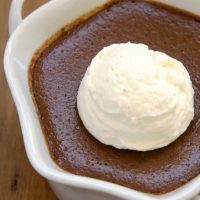 I just found your site; can’t wait to explore more recipes! As a sidenote: cream cheese is one of my favorite foods on the planet. I love cream cheese and jam on toast. Love chocolate and peanut butter together! Delish! I like to make New York Style Cheesecake with cream cheese, and cheeseballs with various add-ins, such as pineapple, bell pepper, and almonds or chipped beef, worcestershire, and scallions. I love to use cream cheese in baked crab rangoons. Thanks for the chance to win. In buffalo wing dip. Yum. Cream cheese frosting for homemade carrot cake. Or slathered on a fresh, warm salt bagel. So delicious. I made these following the recipe exactly, and we thought they tasted terrible. My husband took them to work and even a bunch of hungry engineers would not have a second one, Sorry! But I was bummed they were not tasty for our family dinner! I will definitely try one of your other recipes! I too have created less than perfect recipes!